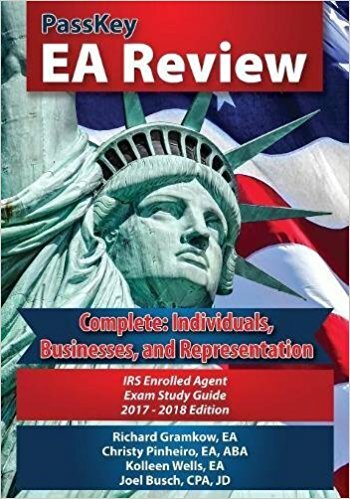 The EA examination or the Special Enrollment Examination is necessary for people (other than certified public accountants and attorneys) who want to practice before the IRS (Internal Revenue Service). Representing their client’s interests in hearings, meetings, or conferences. Overall, an enrolled agent acts as an intermediary between IRS and taxpayers who face problems involving taxes. IRS works with Prometric Testing, a well-known testing US company, to offer students the possibility to take the EA examination all over the USA and abroad (Prometric has about 300 testing sites). To take the examination, you only need a government-issued ID card and you have complete freedom on the resources you use to learn the necessary materials. Each part has 100 questions and a few experimental questions that are not scored (you won’t know which). Out of the questions that are scored, these are multiple choice questions (direct, incomplete sentence, and ‘all of the following except’ style). When it comes to the preparation part of the exam, you must make sure to find the best resources possible. These must contain all the necessary information and must be well-organized and easy to browse. 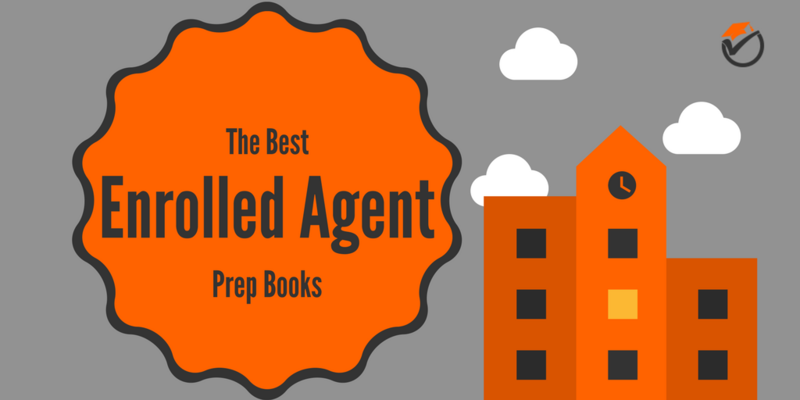 Since we know it can be difficult to find the right guide, due to the multitude of books and materials available, we put together a top 5 of the best Enrolled Agent prep books. So, if you’re studying to be an Enrolled Agent, browse our top and find the best resources that will help you ace that exam! 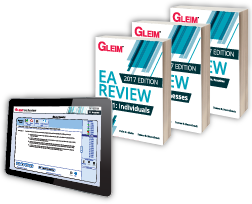 Gleim EA is considered to be the best Enrolled Agent Prep Course available on the market. It comes with 3 books and 3 Test Prep versions that can be acquired together or separately. Each book comes with its corresponding Test Prep and the authors are among the best professional educators in the niche. Each book contains all the necessary data and materials you need for the corresponding step of the exam and each Test Prep contains lots of multiple-choice questions so you can easily apply the knowledge you just learned. 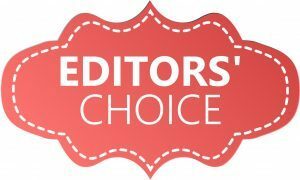 Gleim is also the preferred review provider of the National Association of Enrolled Agents so you can see why their guide is no. 1 on our list. The books offer a comprehensive view of the necessary concepts and knowledge needed for the examination, and the content is highlighted with outlines and examples. This allows the reader to be more focused on learning and increases the retention rate. You should know that the Gleim Test Prep versions, put together, are considered to be the largest bank of questions (3000+) available for the EA examination. Even more, they emulate the exam day perfectly so there won’t be any surprises when the time comes. Another great plus about the Gleim EA books is that they are vetted by tax experts. The entire series is written by two professional educators who are considered to be top accounting authors and are both Professor Emeriti. They also have a team accountants who contribute to the creation of these materials. You will not have to worry about misleading or outright incorrect information from Gleim. We also liked the fact that each chapter is accompanied by quizzes where the correct answer is explained. This way you understand why the others are wrong and it gives you a fantastic chance of learning by applying the knowledge. This is an in-depth guide and contains all the necessary information updated to the latest versions. PassKey's comprehensive EA Review study program also comes with 800 study questions specially designed to help students learn better and faster. To make sure all students are up to date with tax law, the guide also contains the most recent provisions of the Affordable Care Act and the PATH Act, applicable in the latest tax years. In 824 pages, the guide contains comprehensive information on the three parts required for the EA examination. Also, the language is easy to understand and even the most difficult concepts in tax law are well-explained. The PassKey EA Review Guide is the one resource that truly demystifies complex tax law and shows students everything follows a specific logic. Finally, you should know the guide was created with the help of experts in tax law and other aspects. It also has been rigorously vetted by the range of professionals for accuracy, ever since the first copy was published. The only downside we found was that it is not as comprehensive as the first option (it only has 824 pages), but we believe it compensates through the multitude of practice questions that allow you to assess your own progress. The IRS Enrolled Agent Exam Study Guide comes with everything you need to know, and the information is short, precise, and well-defined. However, if you compare it with the previous two guide versions we discussed, you’ll notice that some of the information is missing. So, while it covers all the topics you need, the explanations are not as comprehensive as one might want. Still, if you’re already working in the finance and tax law niche, the IRS Enrolled Agent Exam Study Guide may prove just enough for your needs. This is true because they got rid of all the unnecessary information that makes other guides so bushy (the guide only has 352 pages). Still, in doing so, some of the information that may prove useful for a beginner got lost as well. The authors boast their guide’s efficient content organization and well-built explanations. And they are right to do so! The guide is indeed well-organized and will benefit most of the people trying to pass the three steps of the EA exam. Finally, all the data, information, and questions are up to date for the latest valid sessions for the EA examination. Even more, to help you get into the exam atmosphere, you get access to over 1000 online practice questions that will test your level of preparedness. So, besides being a bit slim on the information a beginner needs, this guide is one of the best resources for your Enrolled Agent preparation. This workbook is only useful to students who already went through all the information necessary for the EA examination. We’re saying this because the book doesn’t have any concepts to review – there are only practice questions with answers. The main purpose of the PassKey EA Review Workbook (2017-2018 Edition) is to help students review their knowledge and assess (correctly) their level of preparedness. You do this by answering each question and then confronting your answer to the correct answer in the book. In case you don’t know the answer to a question or you get one answer wrong, the workbook offers detailed explanations. This way, you understand why your answer was wrong and you learn the correct way to answer that specific question. We chose this workbook as a resource for your review sessions because the authors are Enrolled Agents with years of practice in the field of taxation for businesses (small and large) and individuals, and in tax law. Their expertise led to the creation of a wonderful resource that will test your knowledge and point out your weaknesses. 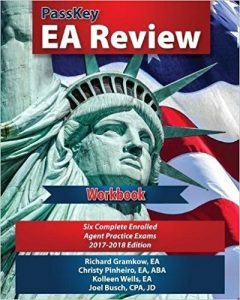 The PassKey EA Review Workbook is made of six EA complete practice exams (two for each of the three parts of the EA exam) and goes very well with the PassKey Study Guide we mentioned above. There are 600+ practice questions in 308 pages and each exam is up to date with the current EA exam cycle. The topics that contain updated information are the Affordable Care Act, Child Tax Credit, the American Opportunity Credit, the PATH Act, and Earned Income Credit. The questions in the workbook are specially designed to fit the exam questions and it has been vetted for accuracy by experts. 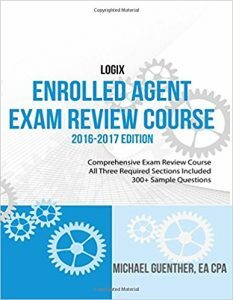 The Logix Enrolled Agent Exam Review guide is created by two tax professionals (one licensed EA and one CPA) and it was vetted by dozens of other tax professionals for accuracy and level of information. While it’s not the most comprehensive version of a prep book for the EA exam, it does offer a lot of useful data and concepts. We would recommend it to people who are somehow familiar to the finance niche, but it will be helpful to a beginner as well. The 320-pages guide contains tips and tricks that help students with the learning and retention process. The concepts and facts are explained in detail but some of the facts are a bit out of date. This is not extremely important because they are not critical concepts in the tax law but still, it is best you know. 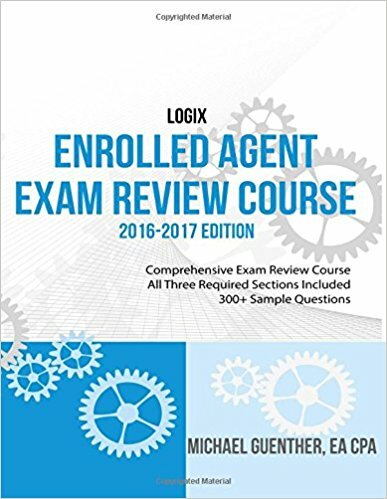 Finally, the Logix Enrolled Agent Exam Review guide comes with 300+ sample questions and answers to help you apply the knowledge you just acquired. And, as a book owner, you can register online and get more questions for free. These will be made available progressively. We know the EA exam is difficult and that it involves a lot of stress, but with the right resources and enough time and dedication, it shouldn’t stop you from getting the career path you want. If you are a beginner, just starting to learn about the world of finances, we highly recommend getting the Gleim EA Test Bank & Books. This guide is comprehensive and well-organized, and experts from all over the world recommend it - it is a bit expensive though. 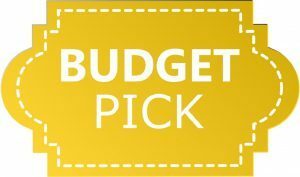 If you’re looking for a more budget-friendly version, the PassKey EA Review Workbook (2017-2018 Edition) is the best choice. However, this is only recommended when you’ve already learned everything you need for the exam as it only comes with questions. 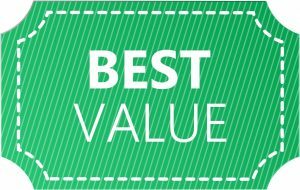 For a beginner, the best value choice is the PassKey EA Review Complete 2017-2018 Edition. When combined with the workbook mentioned above, these two are an unbeatable resource. 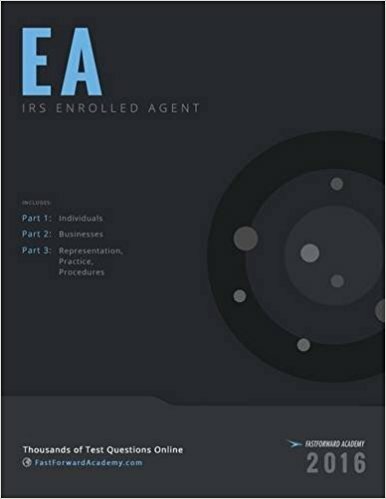 On the other hand, if you are already familiar with the finance niches required for the EA exam, the IRS Enrolled Agent Exam Study Guide 2016-2017 will do just fine. It is not as comprehensive as some of the resources on our list, but it is well-organized and tackles the main topics on the exam.